The FTSE 100 Index is seen opening higher today amid weakness in the pound, which fell sharply on Monday after UK Prime Minister Theresa May cancelled a key vote in Parliament on Brexit. The blue chip index closed down 56 points yesterday to finish at 6721 on concerns about global growth and trade. After cancelling the Brexit vote and leaving Westminster in turmoil, May is now heading for emergency Brexit talks with German Chancellor Merkel. Until traders have any sense of what will happen with Brexit, they will remain extremely nervous. 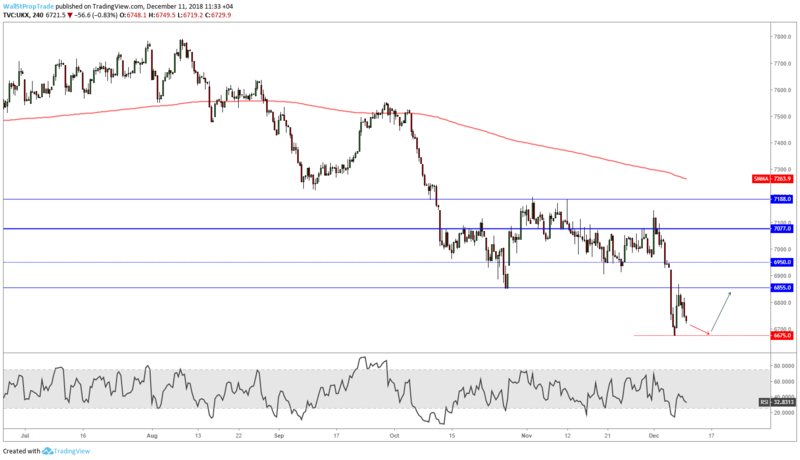 The possibility of a hard Brexit combined with the increasing political uncertainty is creating confusion and volatility for the Sterling as well as for UK stocks. The economic events calendar today has UK unemployment figures at 0930 GMT. Trading about 40 points higher after the open, the market was unable to hold its gains as the bears took control ending the day below its opening price. The FTSE 100 found buyers last week at 6675 confirming that level's importance going forward. Prices might retest these levels before moving higher, however, selling might speed up should prices move below this key level where further sell stops could get triggered. The RSI looks mixed to bearish indicating downward momentum for the next few hours.